Pulling off the Pennsylvania Turnpike Northeast Extension at Exit 31, a sign appears as I turn around the bend: “Folk Fest →.” I ease back in my seat, turn the volume up on the stereo and make my way along Route 63 to the Old Pool Farm in Upper Salford Township where the annual Philadelphia Folk Festival is held. Presented by the Philadelphia Folksong Society, the 55th annual Philadelphia Folk Festival featured live music on eight stages spread out throughout the Godshall Family Farm Aug. 18-21, 2016. It is the oldest continuous outdoor music event of its kind in North America and has had its home on the farm for more than 40 years after beginning at the Wilson Farm in Paoli, Pennsylvania. Its legacy as an odyssey of musical and cultural expression continues to be fueled by the energy of thousands of folks pilgrimaging from across the world to partake in this weekend of rekindling and creating traditions rooted in music, art and cultural expression. Spread out across 80 acres of a working farm, the folk festival contained more than 50 crafters displaying, creating and talking about their handmade art and numerous vendors including the Upper Salford Fire Company, Philadelphia’s own Humpty’s Dumplings and The Roaming Raven of Baltimore, Maryland. Kids were learning how to juggle in Dulcimer Grove and adults were sampling the offerings of Yards Brewing Company in the beer tent. To kick off the festival, David Dye, host of The World Cafe on WXPN 88.5 FM, presented a concert just for campers on Thursday night featuring Liz Longley, Quiet Life and The Sheepdogs. This camp stage concert has seen prolific performers in the past including Sturgill Simpson and each year WXPN records the Thursday night show for a broadcast in September. After setting up tents and grabbing a beer along with the other festival essentials, campers began to come down the hill and settle in on the grass. Shortly after Longley began to perform, the area around the stage began to swell with people as the sun set in the distance. Once it was dark, Quiet Life lead singer Sean Spellman asked the crowd to light up the hillside, which glowed from cell phones, lighters and LED hula hoops twirling in the distance. Hailing from Saskatoon, Saskatchewan, The Sheepdogs played the standout set of Thursday night with a powerful, straight-ahead rock songs led by singer-guitarist Ewan Currie. The band’s hits like “Feeling Good,” and “The Way It Is” have a retro, classic rock feel with two lead guitarists, organ, bass and drums. After whipping the crowd into an amplified frenzy, the band walked offstage for a moment and returned with a face-melting cover of “Whipping Post” by The Allman Brothers Band led by guitarist Rusty Matyas. Eager for more music, campers walked back up the hill began tuning up their guitars, banjos, fiddles and basses. It seemed at every crossroads of the campground there were people gathered around jamming in front of a campfire as a microcosm of the Front Porch stage where the Philadelphia Jug Band was strumming away before a roaring fire. The Culture Tent provided respite from the Friday sun with a full program of music, workshops and discussions as well as a Martin Guitar Jam open to any guitarist who wanted to play a song to receive a set of guitar strings and be entered into a raffle to win a Martin guitar. Each evening, bagpiper Dennis Hangey opened the Martin Guitar Main Stage by playing throughout the crowd, down the hill and concluded in the spotlight. The Friday evening lineup included Iris DeMent, David Myles and Bakithi Kumalo and The South African All-Stars but the three most outstanding sets came from Darlingside, Anderson East and The Lone Bellow. Darlingside performed with all four bandmembers sharing a single microphone while also providing the textured backdrop of bass, banjo, violin and mandolin to capture a soulful indie-folk sound. East revved up the crowd with a dynamic performance of rhythm and blues-influenced southern rock delivered with the ferocity of a southern preacher. 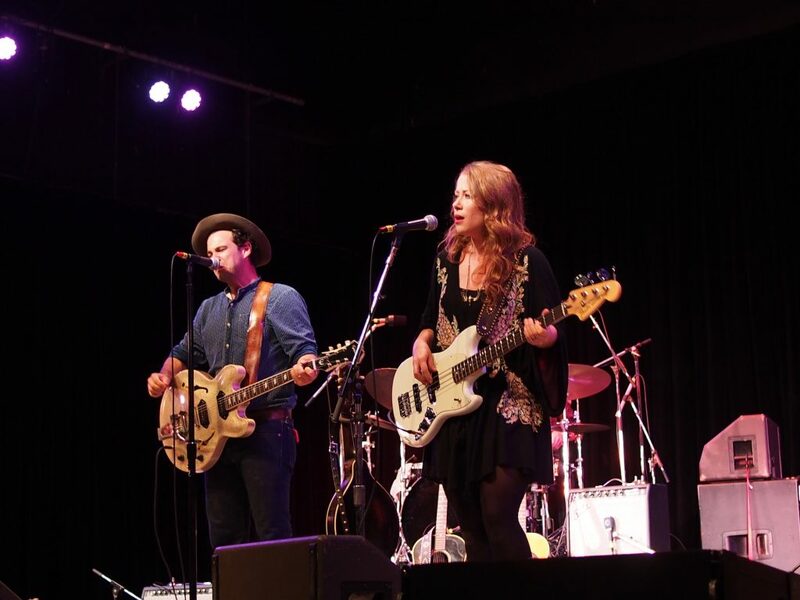 Members of The Lone Bellow joined his band on stage for a song before delivering their own soulful set of folk songs. Although festival founder Gene Shay was ordered by doctors to stay out of the heat, he recorded a video that was played during the festival and he was reached via telephone to get a roaring, “Hi Gene” from the crowd. Throughout the weekend, Wesley Stace, who performs as John Wesley Harding, emceed the festival in his place and provided humor delivered in a British accent. Stace entertained the crowd with jokes and some humorous stories about his children. When he seemed to run out of material, he brilliantly delivered the highlights of “Prog” magazine” and shared with the crowd a collection of 8-track cassettes recently purchased from a yard sale. The positive and light-hearted spirit of the folk festival flows throughout the greater Schwenksville community; from the Lower Frederick Fire Company which hosts an annual pancake breakfast that includes transportation, via tractor, to and from the breakfast, to the Skippack Lions Club delivering nourishment in the campground. Saturday evening provided the strongest lineup with the highlights including sets from French Canadian folk band Vishtèn, Pennsylvania-based indie-folk band The Stray Birds, the incredible Irish accordion player Sharon Shannon, bluegrass duo Del & Dawg comprised of mandolin player David “Dawg” Grisman and guitarist Del McCoury, and personal favorites, the folk-rockers The Wood Brothers closing out Saturday’s concert. The fickle mountain weather provides as much pleasant puffy clouds as it does extreme heat and rain; 55th annual Philadelphia Folk Festival included all of the above. The rain settled over the festival Sunday afternoon shortly after Sharon Shannon performed at the Celtic workshop and hung around until Sunday evening. That didn’t damper any attitudes as people continued to jam throughout the festival everywhere they could; in the campgrounds, in the beer tent, around the crafts area, and even volunteers as they sat guard of the gates. The final performances of the festival included lively sets featuring Marty Stuart and His Fabulous Superlatives, Buckwheat Zydeco sans founder Stanley Dural Jr, but with the mantel taken up by his son Sir Reginald Master Dural; and Los Lobos closing out the festival with a rock ‘n’ roll. As the campers and attendees packed up and said their final “Happy fest” of the weekend, the folksong society began gearing up for its Building Community Through Music program. Spearheaded by Executive Director Justin Nordell, the program aims to create a music school and performance venue in the Roxborough section of Philadelphia. Others, like singer-songwriter Christopher Kent, are planning to take a weekend full of inspiration and refine those ideas in the studio for his next project. Hearing Kent perform by the campfire was the highlight of my weekend. His attitude is exemplary of the festival tradition of sharing musical expression. Of course, the festival and The High Note’s participation in it would not be possible without Festival Director Lisa Schwartz, who is at the front of the stage at every show and for overseeing a fantastic lineup of music each year. Thank you for everything. Save the date for the 56th annual Philadelphia Folk Festival, Aug. 17-20, 2017.